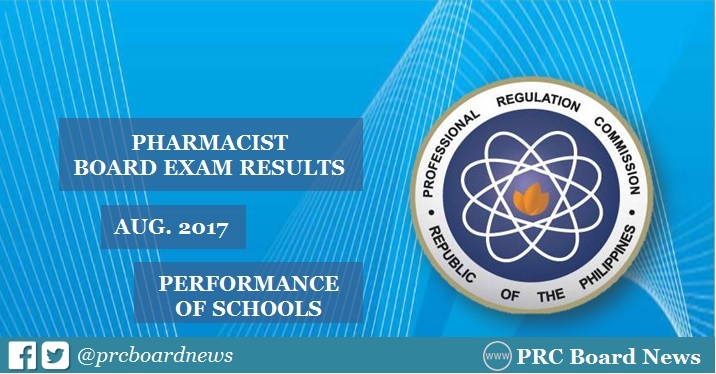 MANILA, Philippines - The Professional Regulation Commission (PRC) recognizes the top performing schools in the August 2017 Pharmacist board exam. The result was released on Tuesday, September 5, 2017 or in two (2) working days after the exam. PRC hailed Saint Louis University (SLU) as the top performing school after garnering 97.27% or 214 out of 220 passed the exams. It was followed by University of Santo Tomas (UST), 92.50% or 296 out of 320 passed. Completing the list were University of San Carlos (USC), Adamson University (AdU) and San Pedro College - Davao City. PRC and the Board of Pharmacy administered the pharmacist board exam on August 30 and 31 (Wednesday and Thursday) in the cities of Manila, Baguio, Cebu, Davao, Iloilo, Tuguegarao and Zamboanga. PRC hailed San Pedro College - Davao City as the lone top performing school in the June 2016 board exam after garnering 88.14% passing rate or 104 out of 118 passed the exams. In the July 2015 exams, Saint Louis University (SLU) dominated the schools obtaining 94.55% or 52 out of 55 passed the tests. It was followed by Our Lady of Fatima University (OLFU)-QC with 94.23% or 49 out of 52 successfully hurdled the exam. Here's quick summary of top performing schools in the previous exams. Pharmacy experts can have a decent vocation development just in the event that they are guaranteed specialists and to wind up confirmed professionals, they need to compose the National Pharmacy Technician Examination. This exam can be composed just by hopefuls who have a secondary school recognition and the individuals who pass the exam led by the Pharmacy Technician accreditation board acquire the Certified Pharmacy. I find a very good website for the Flu Information, If you want you can visit this site.